When you blog about books, every now and again a friend will ask you if it would be OK if their friend, who has just written a book, sends you a copy of their book to take a look at. At first, you might resist, thinking about the piles of books you haven’t gotten to yet, and wondering if it will be worth the time and effort. Well, in my experience, it is usually worth it. 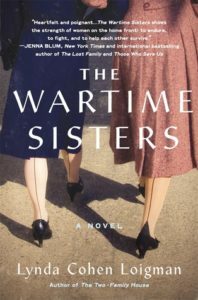 I’ve read and reviewed several books that were recommended to me by friends of the author – such as When Love Was Clean Underwear by Susan Barr-Toman and The Unfinished Work of Elizabeth D. by Nicole Bernier – which I have really enjoyed. The most recent addition to this list is The Two-Family House by Lynda Cohen Loigman, which my friend Tracy told me about. 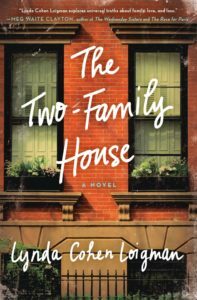 The Two Family House tracks two families – connected by two brothers – who live above and below each other in a two-family house in Brooklyn in the 40s. Mort and Abe own a box company, and Mort, his wife Rose and his three daughters live below Abe, his wife Helen and their four sons. It’s all very cozy until Rose and Helen get pregnant at the same time. After their babies are born, for complicated reasons, the two women drift apart, causing reverberations through both families that have implications for years to come. Loigman’s story is engrossing, realistic and suspenseful. She writes in simple, engaging prose that conveys her characters’ emotions and personalities with skill and subtlety. (Did I mention this is a debut novel?) I grew to care about the characters and how they fared as the years passed. I also enjoyed the shifting narration, which Loigman used to her advantage to share different perspectives on the same events. There are some plot twists that are somewhat implausible, but they certainly make for a good story. There are moments of sadness and poignancy in The Two-Family House which will stay with me a long time. I listened to The Two-Family House on audio, and I didn’t love that version. The narrator, Barrie Kreinik, used some pretty strong Brooklyn Jewish accents that I found ultimately distracting. She did a good job of consistently differentiating the various characters, but I still found the accents a little off-putting. I think I would have preferred reading the print version straight through. If you like engrossing family dramas with shifting perspectives, particularly those set in the past, then I think you’ll like The Two-Family House. Give it a try. Congrats to Lynda Cohen Loigman on a great debut!